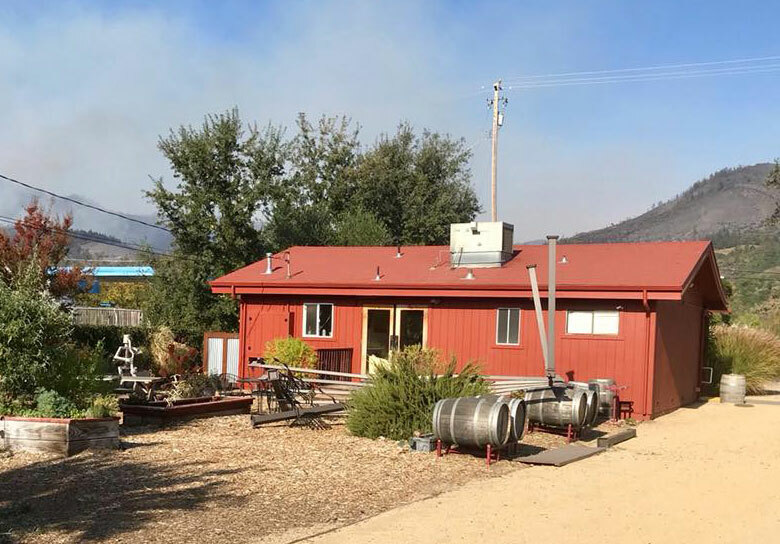 A satellite tasting room Paradise Ridge winery owns in Kenwood, Calif., survived the wildfires started Oct. 8. Santa Rosa, Calif.—It was close to midnight Oct. 8 when Sonia Byck-Barwick went to sleep, ending what had been a busy but normal day during harvest season. Her husband, winemaker Dan Barwick, already had gone to bed at the couple’s home in Healdsburg, Calif., because he had to be up early the next day to oversee one of the last remaining picks for Paradise Ridge winery. Byck-Barwick’s parents, Walter and Marijke Byck, purchased the 155-acre property initially called Paradise Ranch in 1978. The winery opened in 1994. Before she went to bed that Sunday night, Byck-Barwick, noticed something odd: The lights flickered, plunging the home into darkness. About an hour later, she received a phone call from the winery facilities manager. He was trying to get to the winery but couldn’t because the area was being evacuated. Barwick jumped in his car and tried to access the winery north of Santa Rosa, but he soon discovered traffic couldn’t cross U.S. Highway 101. Flames he would later describe as “dragon’s breath” were racing down the Mayacamas Mountains and engulfing any structure in their path. Unable to make it to the winery, the couple had to wait with slim hope that the winery was all right. “That was the start of the chaos,” Byck-Barwick told Wines & Vines. Byck-Barwick said she had some optimism in those early hours, because the winery and tasting room were surrounded by roads and had sprinklers, but around 1 p.m. Monday, they received a photo from a neighbor that revealed complete destruction of the winery, separate tasting room building and other structures. Adding to Byck-Barwick’s stress after the destruction of the winery was uncertainty regarding the company’s satellite tasting room in the town of Kenwood, Calif., on Highway 12 between the cities of Sonoma and Santa Rosa. For nearly a decade, Paradise Ridge had operated the tasting room, which had proved successful in the cluster of other winery tasting rooms. Much of Highway 12 was closed for days as firefighters battled blazes that threatened several wineries and homes in that part of Sonoma County. As the firefight in that area raged, Byck-Barwick heard conflicting reports that the tasting room had been saved or destroyed, and it wasn’t until earlier last week that she heard from the tasting room manager, “giddy with excitement,” that the building was fine. “That was really a great bit of news,” she said. Now the focus is on rebuilding. Byck-Barwick said all the administrative infrastructure of the winery was destroyed in the fire, so she’s begun reorganizing the company from scratch. “Everything is gone; it’s a big job to get our systems back up and running,” she said. The damage is so widespread, Byck-Barwick hasn't been able to tally up the cost of the fires. "Unfortunately we are still have a long way to go in assessing our losses," she said. "At this point all we can hope for is that we have enough insurance to cover it all." Paradise Ridge, known for its two-story, metal sculpture of the word “love,” was a popular wedding spot, and clients that had weddings booked now need their deposits returned. “We’re trying to do it in an orderly fashion,” she said. The rest of harvest had to be completed, too. Barwick immediately began looking for custom-crush space and eventually a friend put him in touch with Moshin Vineyards in Healdsburg, where he was able to bring the rest of the winery’s grapes, including those from an Oct. 13 pick of Grenache, Cabernet Sauvignon and Petite Verdot from the Rockpile AVA. All of the grapes and wine that had been picked and fermented—including wines made with grapes from Paradise Ridge’s estate vineyards—were destroyed, as were most of the 2016 wines in barrel, including barrels belonging to a few custom-crush clients. Byck-Barwick said the company still has a sizeable inventory of bottled wine in a warehouse, and she’s hoping that will help the winery move into the next stage of rebuilding. She said her father already has scheduled a meeting with the contractor who built the original winery. Her insurance agent from Wells Fargo started helping with the claims even as he was being evacuated from his home. The winery’s estate vineyards also made it through the fire.